It would be hard to pick a favorite car from SEMA last year, but one of those in the running would be the Tjin Edition 2011 Mustang. The car features a custom body kit and paint job, Vortech supercharger system, an Air Lift digital air suspension system, Status Racing seats and Forgestar 5-spoke wheels. For this year’s SEMA show it look like Neil Tjin will be following up last year’s car with a custom 2012 Mustang. We won’t have full details for the Mustang until it’s revealed in Las Vegas next month, but we do have a rendering that shows a special Dupont orange paint job, unique body kit and 20-inch Forgestar wheels. The car will also feature a custom interior, Baer brakes, and a Paxton supercharger system under the hood. The best part is that it will be given away as part of a UTI sweepstakes. The Tjin Mustang will be on display at the Vortech/Paxton booth at SEMA, and we’ll be sure to track it down to get more photos and details as part of our live coverage from the show. 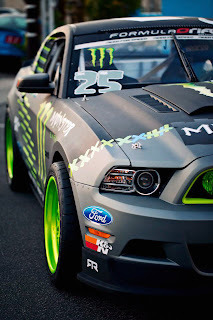 This entry was written by by MustangsDaily (Mustangs Daily) and posted here on Tuesday, October 18th, 2011 at 8:35 pm and is filed under News, sema 2011, tjin 2012 mustang, tjin edition 2012 mustang, tjin edition mustang, tjin mustang. This article was not written by us, rather gathered using RSS feeds listed here. We take no credit for this article. You can leave a response, or trackback from your own site.